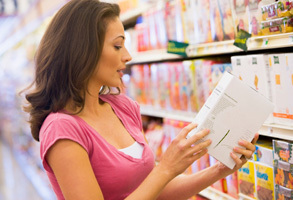 Consumers are increasingly turning to the internet for information about food products, but a report released today says that traditional printed information is still more trusted than online sources, such as social media and smartphone applications. A survey conducted by Melbourne’s RMIT University and not-for-profit standards organisation, GS1 Australia, quizzed consumers about the information they seek when shopping for food products and the channels they trust to deliver this information. Traditional printed materials were consistently the most trusted medium of product information for the surveyed consumers. When sourcing general product information, most consumers said they placed their trust in printed labels (64%), and printed brochures and fact sheets (54%) – compared to 37% for the general internet sources, and just 16% for other electronic sources, including social media and smartphone applications. Mobile text messaging services were the least trusted media, at 9%. The majority of consumers surveyed said they still trust printed food labels more than smartphone apps, and 79% trust printed food labels more than the Internet. According to Professor Caroline Chan, who led the research team from RMIT School of Business IT and Logistics, the results provide the food industry with valuable insights into what consumers are looking for when it comes to printed labels and other channels, such as mobile apps. “Although consumers are comfortable using electronic technology for other routine tasks, they do not currently trust it as a key media channel of food product information,” Professor Chan said. The study also highlighted the information ‘most important’ to consumers when they buy a food product for the first time. Nutritional information came out on top (70%), followed closely by the list of ingredients (66%), irrespective of whether or not the product came from a ‘trusted brand’ (65%). Steven Pereira, GS1 Australia’s Chief Information Officer, said brand owners need to understand what information consumers are looking for, and how best to deliver this to consumers via channels they will use and trust. “As consumers are looking for more product information, the challenge now is to develop credible and reliable electronic sources that can provide a wide range of detailed information about food, which consumers will trust,” Mr Pereira said. Australian Food News recently reported that GS1 Australia has announced September 2012 as the launch date for the GS1 GoScan iPhone application to consumers. GS1 GoScan is the first industry-wide supported iPhone application to provide detailed extended labelling product data to consumers, accurately and in real time. The latest survey indicates that online information faces a challenge gaining acceptance. However, GS1 is keen to meet that challenge. The full RMIT University and GS1 Australia survey report is available here.